When you restore data from an encrypted backup file, Veeam Agent for Microsoft Windows performs data decryption automatically in the background or requires you to provide a password. If encryption keys required to unlock the backup file are available in the Veeam Agent for Microsoft Windows database, you do not need to enter the password. Veeam Agent for Microsoft Windows uses keys from the database to unlock the backup file. Data decryption is performed in the background, and data restore does not differ from that from an unencrypted one. If encryption keys are not available in the Veeam Agent for Microsoft Windows database, you need to provide a password to unlock the encrypted file. The decryption process includes the following steps. Note that steps 1 and 2 are required only if you decrypt the file on the Veeam Agent computer other than the computer where the file was encrypted. You select the backup from which you want to restore data. Veeam Agent for Microsoft Windows notifies you that one or more files in the backup chain are encrypted and requires a password. You specify a password for the imported file. If the password has changed once or several times, you need to specify the latest password. In Veeam Agent for Microsoft Windows, you can use the latest password to restore data form all restore points in the backup chain, including those restore points that were encrypted with an old password. 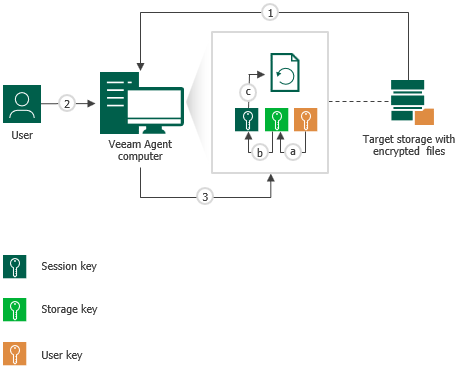 Veeam Agent for Microsoft Windows applies the user key to decrypt the storage key.